Its been an exciting journey since I started blogging. Along the way I have learnt so many new ingredients, recipes and cuisines. I’ve had my shares of flops and hits. I have also learnt how to try and salvage a flop dish, if possible. Looking back, I do have to update some of my recipes. I need to take better photos or do a better presentation. However, my main focus is always on the recipe itself. Since I have started blogging, its also been a way of sharing my thoughts and views with my followers. It’s like a diary which I can go back to whenever I want. Sad and happy events, both have found space on my blog. So today’s event cannot go unmentioned. An earthquake of magnitude 7.8 hit Nepal, parts of India and parts of Bangladesh. The level of destruction, the lives lost, the fear created and livelihoods snatched is enormous and unrepairable. Years back we had experienced a very small tremor in Mombasa, and that event scared me so much. So I cannot even begin to imagine what the people affected are going through. I pray for all affected. I am sure the world will once again get together and help in every possible way. However, such calamities leave a scar on the affected area and people. Earthquakes, tsunamis, floods, snowstorms, sandstorms, forest fires etc. The world is full of natural calamities. Some years back I experienced El Nino in Mombasa, where the rain just wouldn’t stop and we had floods. However, where we were staying we were safe from the rising water, the most affected areas were obviously the slum areas. Our garage and main entrance was flooded but the rest of the house was safe. Now without even torrential rains, a small amount of shower and the roads get flooded as drains get blocked by rubbish. 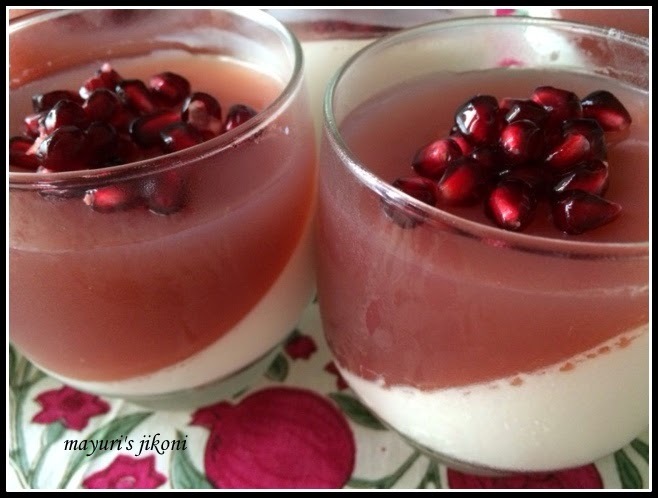 Coming to today’s recipe, I had made the pomegranate panna cotta in Bangalore for my daughter’s friends. However that time it didn’t set too well. Perhaps there was something wrong with the gelatin. Today I made some using agar agar and was pleased with the outcome. Vanilla, pomegranate and a hint of lemon is a tongue tingling combination. Have you experienced any natural calamity? Warm the milk up. Add agar agar to it and let it stand for 15 -20 minutes. This allows the agar agar to soften. Add cream and sugar to the milk and agar agar mixture. Heat the mixture over medium heat. Stir constantly till the agar agar dissolves. Take the pan off the heat. Add vanilla extract and lemon zest. Pour the mixture in 6 individual containers. Put the panna cotta in the fridge till it sets. This will take about 1-2 hours. Mix juice, sugar if using any and cornflour together. Heat the mixture and stir it constantly till it thickens.This takes about 5-6 minutes over medium heat. Pour it over the set vanilla panna cotta. Put the panna cotta in the fridge till the top sets. This will take about 1-2 hours. Add a few pomegranate arils before serving. Use fresh or ready made pomegranate juice. If you cannot get fresh whipping cream, use amul cream or any tinned or carton cream. To get the slanted effect, place the glass in a muffin tray at an angle to set. congratulations on 500 and what a treat to eyes and tastebuds too, keep on going. Delicious panna cotta, and congrats on your 500 post. Congrats, the panna cotta looks absolutely delicious, nice presentation..
Panna cotta looks very delicious!